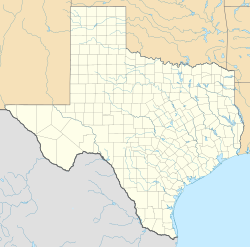 Cistern is an unincorporated community in southwestern Fayette County, Texas, United States. It is located on Texas State Highway 95, 12 miles (19 km) northwest of Flatonia. It was formerly known as Whiteside's Prairie and Cockrill's Hill. Cistern had a population of 75 as of the 2000 census. Cistern is on a hill surrounded by much flatter prairie land. Originally it was the portion of a league of land granted to John J. Whiteside by the government of Mexico in 1835 which early settlers called "Whiteside's Prairie". Stark S. Cockrill, who came from Missouri in 1852, was the first settler at the hill where he built a general merchandise store. Other settlers followed soon after and the town was surveyed and platted into blocks. At that point the developing town was known as "Cockrill's Hill" and remained so until 1857 when the townspeople applied for a post office permit and changed the name of the town to "Milton" (the name of Cockrill's son). The application for that name was denied. After deliberations the citizens decided to name the town "Cistern" because the water wells in the area had high mineral concentrations requiring that they use cisterns for drinkable water. It is said that the townspeople went to the large cistern at the mercantile store so often that the most common answer given when they were asked where they were going was "to the cistern". The Cistern post office opened in March 1858,  and the town has been known by that name ever since. In 1900 Cistern had 150 residents and a general merchandise store, a drugstore and saloon, a blacksmith shop with a gin, and a doctor. In 1950 Cistern had 150 people, two stores, two garages. The Cistern Post Office was discontinued in December, 1953, after which Cistern residents received mail from Flatonia. In the 1950s and 1960s cotton became less popular as a crop, and more landowners turned to ranching and producing chickens. Some oilfields were discovered in the 1950s and 1960s, and a number of wells were drilled, although most were eventually plugged, with the land turned back into pasture. In the 1980s Cistern had 75 residents and three businesses. In both the 1990 and 2000 census the community had 75 residents. Cistern had Anglo-American, Czech American, and German-American residents. The community was focused on Catholic and Lutheran churches, the Harmony Club, fraternal organizations, and the local school. Cistern is within the Flatonia Independent School District. During points in its history Cistern had its own school. In 1950 Cistern had a consolidated high school with two teachers. ^ Beck (September 25, 1980). "An Early History of Cistern". The Flatonia Argus. Retrieved 7 January 2013. ^ Carroll, Jeff. "Cistern, TX". "Handbook of Texas Online. Texas State Historical Association. Retrieved 7 January 2013. ^ "Montgomery County, TX Land Deeds". Genealogy Trails History Group. Retrieved 7 January 2013. ^ Lotto, Fank. "Fayette County, Her History and Her People". Fayette County TXGenWeb Project. Retrieved 7 January 2013. ^ Kulhanek, Katie. "Cistern: A Town of Many Names". Fayette County Historical Commission. Retrieved 7 January 2013. ^ Beck. "An Early History of Cistern". Flatonia Argus. Retrieved 7 January 2013. This page was last edited on 14 January 2018, at 21:22 (UTC).